Here at the Center for Ecolonomic Excellence and Development (CEED) and Nourish the Planet (NTP) we are excited to hold our “Huddles” webinar for our staff, interns, alumni and guests. After running our Webinars on WebinarJam for almost two years, we have gone back to using an older platform, that is an industry standard, GoToWebinar. And now, we do live webinars almost every day! Click here to join us on Mondays with – Yes, You Can Make Money with Environmental Consulting! Click Here to join us on Mondays with – What is this EAT Thing? How can it be Free? Tell me about it! 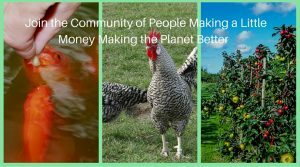 Click Here to join us on Tuesdays with – Permaculture Apprentice a Transition with William Horvath! Click here to join us on Tuesdays with – Our Weekly EAT Lifecast/simulcast! Click Here to Join us on our Weekly EAT Intro Webinar! Mike Warren, of Alternative Health Concepts, shared with us how he was able to overcome a debilitating chronic asthma condition with the natural immune system supplement BioPro-Plus and how this, and other life-changing health successes, led him to co-found AHC. Partners and Friends of CEED; including Progressive Farms, ServLife, Alpaca Gold, Alternative Health Concepts and Saving the Green; joined us this week to introduce themselves and share a bit about their Ecolonomic activities. Here we have a collection of some of our best webinar over the past few years, and also DrEcolonomics with our First Blab Ecolonomics in Action. Robert Kumapley. PE., LEED AP. is an entrepreneur and waste to wealth innovator and a licensed Professional Civil Engineer, with over 25 years experience in Ghana, United Kingdom and The United States of America. This week, we are proud to present Aja Duniven as our Biweekly Huddle Guest! Aja has an innate desire to help alleviate suffering for others and bring peace to the world. She has created a playful and fun set of transformative games that weave players through real world events, cartoon worlds, and personal growth through storytelling. She pays immaculate attention to the smallest details that show players the world is changing before their very eyes and was designed for them to have fun becoming who they were born to be while helping others do the same. We are delighted to announce our next bi-weekly huddle hangout with Charyl Cran on Wednesday, September 2, 2015 at 1:00 PM MST, Live form our NTP/CEED headquarters. Cheryl provides leaders and teams (r)evolutionary change leadership skills to lead with 2020 vision with the leading edge tools to build the future workplace today. Cheryl’s research into the future of work, change leadership, technology innovation and generations impact provides data and strategies to inspire leaders to drive transformation in a fast paced world and to create the future workplace TODAY! Dr. Nancy Irlbeck is responsible for “anything” academic involving students, curriculum, and teaching. Her greatest passion is the student, who she says are the most powerful people on campus. She works to recruit future students, support current students, and maintain a relationship with our graduates. Nancy fervently believes in the future of agriculture. We are delighted to present Evan Folds of Progressive Farms as our Huddle guest. The mission of Progressive Farms is to grow clean local vibrant beyond organic food free of toxins and GMO’s, provide open source information to develop premium products and services that allow people to take control of their own personal agriculture, connect and decentralize our food system, bring focus towards the qualitative value of food and grow as much of it as possible! NTP/CEED proudly welcomes Professor Robert Zimdahl, a retired Professor of Weed Science (37 years at CSU), Dept. of Bioagricultural Sciences and Pest Management, and the author of 14 books including Agriculture’s Ethical Horizon (2012). Robert is presently a peasant farmer. He earned his BS and MS from Cornell University and his PhD from Oregon State University. He has lived in three foreign countries and traveled in 40+ other countries. We are exited to have Elizabeth Mozer, co-owner and founder of LoCo Foods, as our webinar guest. The idea for LoCo Food distribution came from our struggle to locally source products for our other business, The Lyric Cinema in Fort Collins. We found ourselves driving all over to meet farmers to get local products. Our vision is to make it simple to purchase local. We are excited to have Shannon Welsh, Executive Director of Pacific Northwest Fibershed as our huddle guest. On this webinar she talks about her farm, sustainable fiber production and her future plans in the fiber industry. This is another exciting webinar with our huddle guest Taber Ward, founder and Executive Director of MFD. On this webinar Taber talks about Mountain Flower’s daily operations, employee supervision, herd-health, food safety protocol, volunteer and intern program, milk shares and education programs. This week on our bi weekly Webinar, Elizabeth Folgen joins us. She is the Chairman of Redrhino, a South African purpose-driven company that exists to support the Lapalala Wilderness School (LWS) in the Waterberg, South Africa. In this webinar, we are chatting with Cheryl Coates of Tiny Diamond Homes in Morrison Colorado.Tiny Diamond Homes is a licensed and insured general contracting company with over thirty years of residential construction experience and has applied all that experience to their tiny homes. Beth Conrey, Owner of Bee Squared Apiaries, joined us to talk about her experiences as a chemical free bee keeper and farmer. Øistein Thorsen with Benchmark Sustainability Science. Øistein has an MSc in International Political Economy from the London School of Economics (LSE) and a BA in African Studies and Development Studies from SOAS. This week NTP/C.E.E.D brings Ben Pfeffer on to talk about the exciting things happening at Raisin’ Roots and Mountain Sky Ranch.Sustainability Sustainable Development, and Sustainable Agriculture. This week NTP CEED Biweekly Hangout celebrates it’s one year anniversary! What better way to celebrate than a “best of” replay! We are delighted to have Jason Aubrey, of Global Food Exchange and friend of CEED, as our Huddle guest. We learned about their efforts to help feed the world. We’re delighted that we were joined by Russ Biaggne at our bi-weekly Huddle/ Webinar. Russ owns a sustainable cleaning business, Selway Services, and lives a sustainable lifestyle. We’re delighted to have as our bi-weekly Huddle/ Webinar guest, Alicia Rocco, Natural Health Practitioner, certified by the American Association of Integrative Medicine and owner of Alpaca Fiber Insulation Company of Ohio. We’re delighted to have Anndrea Hermann, President of Hemp Technologies and Chief Development Science Officer, Hemp Division of Creative Edge Nutrition as our huddle guest. We’re delighted to have Giuseppe La Manna, CEO/CTO – EcoLogix Sustainable Business Solutions, LLC as biweekly Huddle/ Webinar guest. Mr. La Manna is Italian born and US educated in Electronic Engineering. After 32 years as an entrepreneur in Venezuela, and 5 successful start-ups, he is now CEO/CTO of EcoLogix. Based in Coral Gables, FL, this business is a management consulting firm specializing in Integral Sustainability. This approach aims for “whole system” sustainability within a business and its relationships, related to green, renewable and energy efficiency. We’re delighted to have Jeff Finkle, President and CEO of the International Economic Development Council as our huddle guest. As President and CEO of the International Economic Development Council (IEDC) – the world’s largest economic development membership organization – Jeff Finkle is a recognized leader and international authority on economic development. We’re delighted to have Dr. Jennifer Orlowski, ND at PURE WELLNESS as our huddle guest. Her focus is preventative care, management and restorative support of chronic illness usually through dietary changes. Dr. Orlowski is trained to recognize the complex relationship between the mind, body, emotion and environment unique to each individual. We’re delighted to have Glenn Meyers, CEO of Green Building Elements and Green Street Media, as our huddle guest. Glenn is a writer, producer, director and a contributor to CleanTechnica, and founder of Green Streets MediaTrain, a communications connection and eLearning hub. Bob Christadore talks about his life experiences as he shares the life-changing realizations that caused him to transform his own life and create Balanced Life Team. Bob is the co-founder of Balanced Life Team, with which he is determined to helping people with their lives, in finding balance in all four pillars on which life must balance on, and those being financial, emotional, mental, and physical health. Meet the environmentalists of the future! Learn about our current Interns and the projects they’re working on. Our Huddle guest, Janie Gianotsos, Director of Marketing & Community Relations at the Food Bank of the Rockies discussed with us the very real problem that hunger is right in the USA and what their vital organization is doing to help the “one in seven Coloradans [who] worry where they will find their next meal.” We also got to know Janie better and learned about the life path that led her to where she is today. A Huddle webinar with Michael Butts, a leader at the Urban Farm at Grace Place Church in Berthoud, CO. Michael is not only an urban farmer but a pastor and artist too. Here he talks about many aspects of aquaponics, photography, and art and many of his life experiences. Dustin Dorband tells us about his role in our sustainable agriculture projects, innovative aquaponic systems and his life’s journey. Dr. Wayne Dorband discussed the Healthy Ecolonomic Life Program or HELP. This program shows you how you can change your life primarily through your diet and exercise, enabling you to live a life where you are happy, healthy, productive and more efficient. Our facilitator, Dr. Wayne Dorband, has directed our operations from the start and knows more about our efforts than anyone. He will seek the thoughts of other staff throughout the Huddle. This week, our webinar featured Tracey Long, a local food activist, with an amazing track record of inspiring communities to come together and create sustainable local food sources. Watch her intimate interview with Wayne Dorband, as she talks about her achievements, experiences, goals, and lots more cool stuff. Justin Lichter is one of our young leaders here at CEED. Justin is an awesome writer (having written two books) and has a great story about his own “epiphany” to live a more sustainable lifestyle. Justin is one of the foremost adventurers in the world (one of only three people to have hiked the Appalachian, Pacific Crest and Continental Divide trails – TWICE!! ), and most importantly is just a great guy. Our Weekly NTP/CEED webinar huddle, with our interns, and a live world wide audience. This week we did a replay of an older webinar with Amy Hutton, where she gives us ideas on sustainable farming. It’s amazingly informative. On this huddle we had a discussion with one of the world leaders from the field of aquaculture who we will be visiting with at the World Aquaculture Conference we will be attending in Seattle, WA. I know they will have some very cool information for us to discuss. Please come and be with us. View recorded version of our second NTP/CEED weekly Huddle webinar/seminar on Wed. Feb. 5 at the Loveland CEED Headquarters. On our second Huddle we discussed all the projects, programs, and ventures in which we are involved. This includes views of our websites and other cool stuff. We had a great time last Wed. (Jan, 29, 2014 ) at our first weekly NTP/CEED Huddle seminar/webinar. Our interns and staff enjoyed being the local audience. There were some great questions and answers from our group. You can watch a replay of this new event here. Give us some of your comments. You can now view the recorded version of our original webinar series “Ecolonomics in Action” on YouTube. Please click here to view our channel.